"The 2015 Pinot noir is carefully blended from 3 vineyards in the Lowburn and Bannockburn sub regions; our estate vineyards of Morrison and Muirkirk plus grower vineyard Pisa Terrace. All are farmed using certified BioGro organic practices. The vineyards are planted with a mixture of the Dijon clones and cropped at an average of 35 hectolitres per hectare, all vineyards being planted between 1997 and 2000. – before racking and settling in tank for a further 3 months. 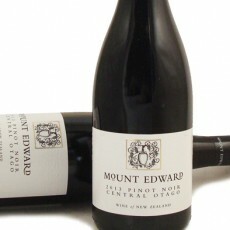 Fermentation was carried out using de-stemmed fruit including the addition of 25% whole bunches. "Perfumed with lovely aromatics, there is a range of complexed fruit notes of red cherry and darker berryfruit, some spice, savoury tones and dried herbs. The 2015 has a silky and lush texture, medium in weight and concentration, fine tannins and long in length."